Perhaps the loveliest time to observe The Cuckolds is at sunset from a boat close by to the eastward. The white light against a glowing red and golden sky... the dark outline of the trees on Cape Newagen, and tired seagulls winging their way eastward . . . produce a scene and a sense never to be forgotten. -- Malcolm F. Willoughby, Boothbay Register, 1962. This oddly named lighthouse is one of the last to be built on the Maine coast. The name Cuckolds, given to a pair of treacherous ledges at the entrance to Boothbay Harbor, is apparently after a point of land on the Thames River in England that was granted to a London man to assuage his anger after King John had an affair with his wife. The Cuckolds in Maine may have been named by a transplanted Londoner. A tripod-type day beacon was located on the Cuckolds since1874. In 1890, a recommendation was made for a fog signal station, stating that the Cuckolds were "dangerous of approach on their southern side on account of the reefs in that direction, and the shoals which extend half a mile to the westward of the western rock. . . . They are much dreaded by mariners in thick weather." In 1891, a sum of $25.000 was appropriated for the building of a fog signal station. The lighthouse tender Myrtle brought 650 tons of materials to the Cuckolds, including 60,000 bricks. A steam-driven Daboll fog trumpet was established in November 1892, with an attached double dwelling. In 1902, a new oil-powered fog signal was installed. Wrecks continued in the vicinity in spite of the fog signal station. In January 1896, Cuckolds fog signal keepers Edward H. Pierce and Clarence Marr rescued six crewmen of the Canadian schooner Aurora on a bitterly cold night with the help of two lobstermen from Cape Newagen. The rescuers were awarded silver watches by the Canadian government. 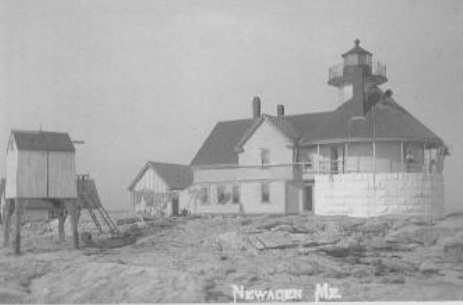 Local mariners believed a lighthouse was called for, and the government finally agreed in 1907. The Cuckolds was too small to build a separate lighthouse, so a small tower was built on the roof of the signal house. There have been a number of rescues in the vicinity of the Cuckolds. In September 1925, Keeper Fred Robinson rescued several people from a motorboat that was drifting near the lighthouse. Keeper E.D. Elliot towed a disabled boat holding seven people to safety in the fall of 1930. In January 1933, a storm swept the station and destroyed the belongings of Keeper Harold Seavey, who was reimbursed in full by the Department of Commerce. Another keeper's wife said she was sewing near a second-story window one August day when a "freak wave" poured through the window, damaging much of the furniture. The Cuckolds was about a mile or so offshore and was exposed to the open ocean. The waves washed on the shore relentlessly and were never silent. I measured the island with a tape measure and calculated it to be roughly 520 feet in circumference at the high water mark. Life on the island was pretty much a routine of standing watches and cleaning and painting any non-moveable items on the island. The Cuckolds was a family light with two families assigned, and the personnel stationed there got two days a month shore leave. Occasionally the women and even the men could leave the island, but the men always had to be there at night. There were often weeks at a time when the water around the island was so rough that we couldn't leave at all. Because we seldom got off the island, we always needed at least a month's worth of food and other supplies. They say lighthouses are romantic, but I do know that this one had quite a reputation concerning the divorce rate. I would say it takes a sturdy relationship to endure that much togetherness. There is no time apart unless the wife goes ashore alone. We had a gale come up the coast and they wanted us to evacuate the light, but we couldn't get to the helicopter pad as it was located on the smaller outcrop island and the tide was high. We rode the storm out in the tower. When we left the house for the tower we had a foot of water in the keepers' house. After the storm was over we lost the large fuel tank and damage was done to the boathouse. It was a long night. Circa 1960, from film taken by Edward Rowe Snow Courtesy of Dorothy Bicknell. Jim Roche and his mom Pat Roche, wife of Coast Guard keeper Jim Roche, in 1966. 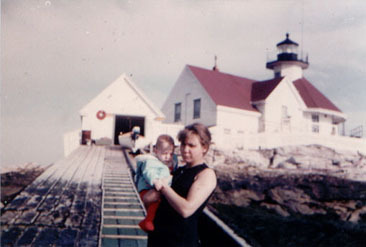 Jim's first home was the Cuckolds Light Station. Courtesy of Jim Roche. The light was automated in late 1974. The old fourth-order lens is now on display at the Maine Lighthouse Museum in Rockland. It's a rare American-made Fresnel lens from the MacBeth Glass Company of Pittsburgh. Many sources claim that a blizzard in February 1978 destroyed the keeper's dwelling, but according to Coast Guard sources it was demolished in 1977. 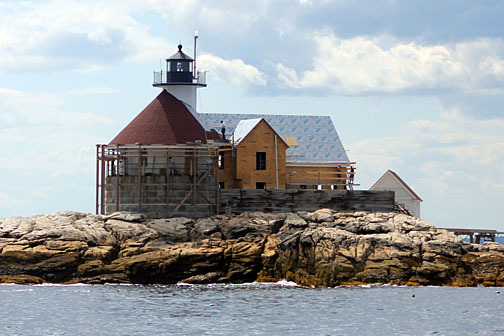 In May 2006, ownership of the lighthouse was conveyed to a local nonprofit organization, the Cuckolds Fog Signal and Light Station Council, under the guidelines of the National Historic Lighthouse Preservation Act of 2000. The group undertook the rebuilding of the keeper's quarters in 2011, made possible in part by a donation of supplies by Hancock Lumber. Below: A slideshow of photos from an inspection visit in October 2004. The lighthouse still exhibits a flashing white light as an active aid to navigation. It can be seen from many of the excursion boats out of Boothbay Harbor and from a public landing pier at Cape Newagen. The keeper's house has been made available for overnight stays as the Inn at Cuckolds Lighthouse. During the reconstruction of the keeper's house in 2011. Edward H. Pierce (1892-1899); Clarence Marr (assistant, 1892-1899); A. M. Taplet (Sept 1, 1899-1903); George A. Lewis (May 15, 1903-1907); Preston Marr (1907-1920); Foster Reid (Reed?) (1920-1925); Fred Robinson (1925-1930); Edward D. Elliot (or Elliott) (c. 1930); Harold Seavey (assistant, c.1933-1937); Justin A. Foss (1934-1939); Everett Quinn (1937-1939); Weston Thompson (1941); Floyd Ettinger Singer (1941-1943); Merrill Poor (1944-1945); Steve Hanson (Coast Guard, ?-1954); Jim Eyles (Coast Guard, c. 1954); Norm Rozema (Coast Guard, 1954-1955); Harry Cressy (Coast Guard, c. 1962); Wayne Mills (Coast Guard, c. 1963); Peter Decatur (Coast Guard officer in charge, c. 1962-1963); Ed O'Shea (Coast Guard assistant, April 1963 to September 1963); Walter Dodge (Coast Guard, Feb. 1964- Oct. 1965); Stanley Lund (Coast Guard, c. 1964-1965); Wendell Urquhart (Coast Guard, 1966); Jim Roche (Coast Guard, 1966-1968); Roger Greenwald (Coast Guard, 1967); Dave Bennett (Coast Guard, 1967-1969); Ramon (Kelly) Farrin (Coast Guard, 1969-1970); Larson Alley (Coast Guard, 1969); Harland Lamper (Coast Guard, late 1960s, early 1970s); Jim Mickon (Coast Guard, ? ); John Sitton (Coast Guard officer in charge 1972-1974); Kevin Alway (Coast Guard assistant officer in charge 1972-1974); Joseph Denis (Coast Guard 1972-1973); John Phillips (Coast Guard 1973-1974).